Lower rhytidectomy, popularly known as neck lift, is a cosmetic surgery procedure designed to enhance the neck appearance and mitigate the signs of aging. Sagging neck skin, unsightly neck bands, loose muscles in the neck, and excess fat deposits in the neck can be corrected with neck lift, which may sometimes be combined with neck liposuction. Facial plastic and reconstructive surgeon Dr. Eric Yavrouian provides neck lift surgery to patients in Glendale, Pasadena, Burbank, Greater Los Angeles, Beverly Hills, CA, and surrounding communities that stretch across Southern California. A neck lift is a prominent procedure that can create a sculpted and slimmer neck appearance, and make a person look more youthful. In many cases, neck lift is combined with facelift surgery to create more significant and natural looking aesthetic results. In addition to tightening loose neck skin and sagging underlying muscles, neck lift can also improve a jowly appearance to reveal a more defined jaw line. A neck lift can give an impression that the person has gone through a weight loss, and is looking slimmer. However, patients should be aware that neck lift is only a body contouring procedure, and they should have realistic expectations from it. If the skin laxity in the neck area is minimal, but a double chin appearance is showing because of excess fatty tissue, the surgeon may only recommend neck liposuction. However, if the skin elasticity is poor in the neck area, the surgeon will perform neck lift to remove the loose skin and tightening underlying loose or separated muscles to give a subtle lift to the skin. Only small incisions will be placed behind the ears and under the chin to minimize the visibility of subsequent scarring. Excess fat tissue may be eliminated using surgical excision or neck liposuction. If the neck muscles are slack, these may be repositioned and tightened using the same incisions. In some cases, the surgeon may remove a portion of the platysma muscle. Once the neck tissue is lifted and tightened, the surgeon will re-drape the remaining skin over the neck and pull it smooth and taut. Loose skin will be excised and the incisions will be closed with sutures. 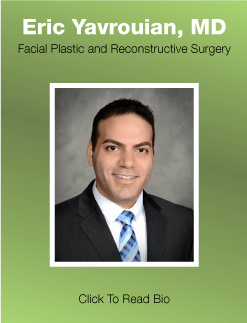 Facial plastic and reconstructive surgeon Dr. Yavrouian receives patients from Glendale, Pasadena, Burbank, Greater Los Angeles, Beverly Hills, CA, and nearby areas for neck lift surgery.